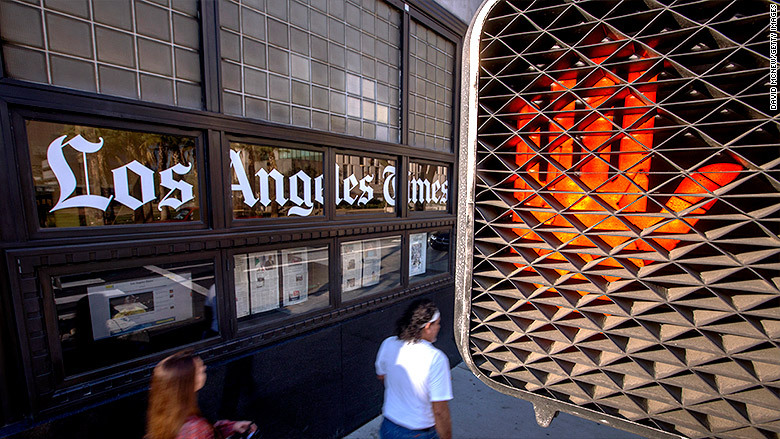 Dozens of news organizations spanning the media spectrum are expressing support and solidarity with the Los Angeles Times over a federal judge's order for the newspaper to alter a published story. In a letter filed Monday in the Ninth Circuit Court of Appeals, the Reporters Committee for the Freedom of the Press called for a reversal of the district court's ruling over the weekend, describing it as "unconstitutional." On Saturday, the Times published a story about a Glendale, California, police officer named John Saro Balian who pleaded guilty to charges that he lied to federal investigators regarding his link to an organized crime syndicate. The story included details of the defendant's plea agreement, which was under seal but posted mistakenly in an online court database, where it was found by a Times reporter. After receiving the order from Judge John F. Walter, the Times complied and removed details of the plea agreement. The story now includes an update at the bottom telling readers that those references were scrubbed. "It appears that the district court may have entered the temporary restraining order in an attempt to correct the mistaken public filing of the plea agreement, which was meant to be kept under seal," RCFP's letter said. "The district court's desire to correct this administrative error, however, cannot justify the imposition of a prior restraint, which has now created a constitutional harm." Many First Amendment advocates said the decision to impose prior restraint, the act of preventing the publication of material, after the story was published is highly unusual and alarming. In its letter, RCFP invoked the case surrounding the Pentagon Papers, noting that the Supreme Court "rejected a prior restraint" preventing their publication "in spite of the government's claims that an injunction preventing publication was necessary to protect military secrets." RCFP also argued that Balian "cannot possibly meet his burden to overcome the First Amendment presumption against prior restraints." "Because the defendant has pled guilty, his Sixth Amendment rights are not implicated," the letter said, referring to the section of the Bill of Rights that guarantees an accused person to a fair trial. Fifty-nine news organizations, including CNN, the New York Times, the Associated Press, CBS, ABC and BuzzFeed, signed on to the RCFP's letter. In addition, the Los Angeles Times filed an emergency motion for a stay in the Ninth Circuit on Sunday night. Times executive editor Norman Pearlstine defended the paper's decision to publish. "We believe that once material is in the public record, it is proper and appropriate to publish it if it is newsworthy," Pearlstine said in a statement this week. This is Pearlstine's first public legal battle at the helm of the Los Angeles Times since he took over as editor last month. But Craig Missakian, Balian's attorney, said that the First Amendment "does not grant the press an absolute license to put another man in harm's way." "In restraining the Los Angeles Times from disclosing details of an under seal filing--details that will put defendant and his family at risk--the court's order struck the proper balance between freedom of the press and defendant's equally important due process rights," Missakian told CNN in an email on Monday. "The Times claims it had the legal right to disclose the confidential document but apparently gave no thought to whether it was the right thing to do."